A refreshing take on a taboo topic, Oh My Ghost has quickly emerged to become one of the most popular romantic comedies of the year with its superb cast and acting. 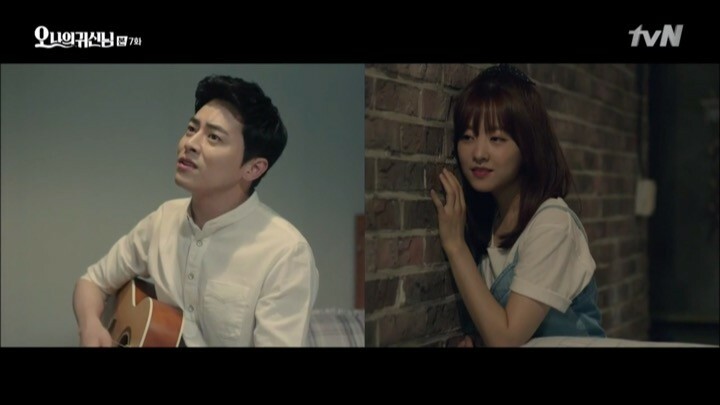 The story centers around our three main characters, renowned chef Kang Sun Woo (Jo Jung Suk) of Sun Restaurant, his kitchen assistant Na Bong Sun (Park Bo Young), and a ghost with a virgin grudge Shin Soon Ae (Kim Seul Gi). Hilarity ensues when the ghost possesses Bong Sun, a normally reclusive and unconfident cook, causing her to suddenly transform into an outspoken, forthright maneater who begins to target the good-looking chefs in the kitchen. 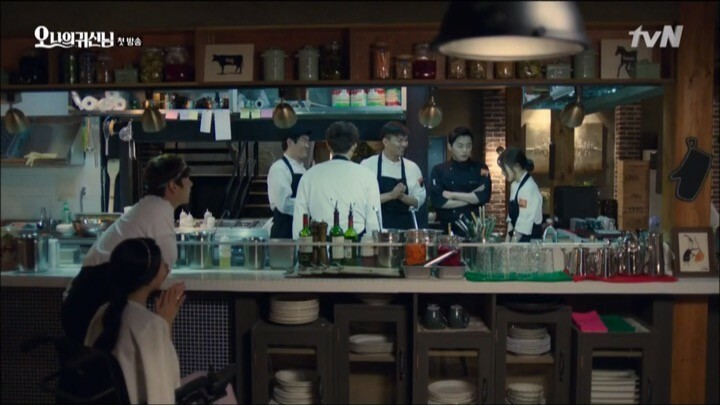 In addition to the sparkling chemistry among the actors and the dynamic supporting roles, the cinematography of Oh My Ghost is further brightened by the fast-paced restaurant kitchen where many memorable scenes take place. I also appreciate how Oh My Ghost deals with themes of identity, family loss, murder mystery, and of course food, which makes for a very full story. I have cried deeply, laughed hysterically, and fallen in love with the characters. Already within the first few episodes, I have cried deeply, laughed hysterically, and fallen in love with the characters. I like that Oh My Ghost spends time developing the backstory of each of the leads. Although Bong Sun and the ghost seem to have vastly different dispositions, there is a deep sense of loneliness that emanates from both of the main female leads. Thus, the audience’s anticipation builds knowing that somehow their lives will change for the better when their paths cross. The ghost is perfectly cast with Kim Seul Gi. I had heard that she was hilarious in her previous roles. Indeed, her acting is refreshing, likeable, and funny, with just the right amount of sass so as not to be annoying. We learn that she has a virgin grudge: she never had the chance to be intimate with a man so her spirit can’t leave until she has fulfilled this desire. Hungry for men, she possesses female bodies to seduce her victims, but unfortunately, none have been men of virtue (enter male lead). Unlike other Korean dramas, Oh My Ghost doesn’t reveal how Soon Ae dies or dwell on how she copes with the shocking discovery of her shift to the spiritual world. Instead, our ghost is already a veteran spirit, which adds a sense of mystique and moves the storyline along much more quickly to the meaty parts. As for Park Bo Young, I vaguely recognized her prior to this drama, but now I will be on the lookout for all of her future roles. Her interpretation of Soon Ae’s character is so on point that it actually feels like Soon Ae has possessed her. Not only that, the switch from her original apologetic personality to her new feisty persona is so stark that you eagerly look forward to how her dynamics with the male lead will evolve. I am impressed by how Park Bo Young excels in her bipolar acting and how she does such a consistent job of exuding a vibrant energy without being too over the top. 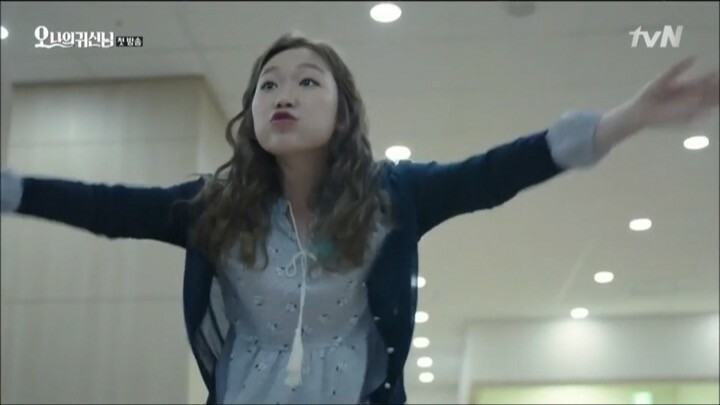 I will be on the lookout for all of Park Bo Young’s future roles from now on. Kang Sun Woo is equally loveable. Although he initially acts ruthlessly and seems to be an arrogant hothead, we quickly discover his softer, more charming side. He isn’t easily lured by attractive women, he playfully flirts with ahjumma seafood vendors, he works hard to pursue his passion, and he’s surprisingly gracious to his employees. The other assistant chefs at Sun Restaurant also add liveliness to Oh My Ghost with their own distinct personalities and constant bickering. Overall, the first few episodes are very engaging, with each of the main characters showcasing interesting narratives. The storyline is simple, clear, and well-written, and the restaurant theme jives very well. 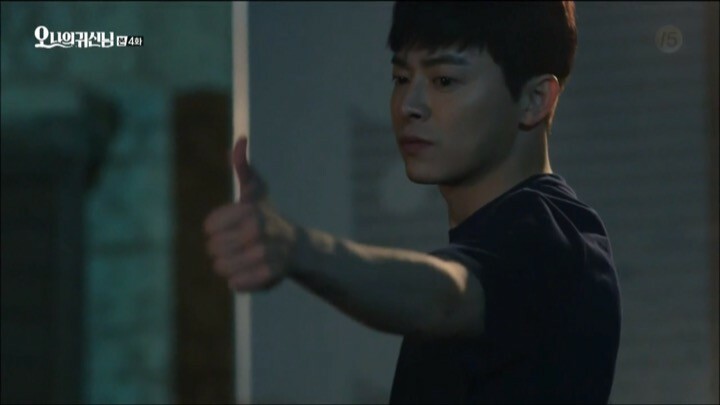 After quickly establishing its premise and characters, Oh My Ghost becomes even more gripping thanks to an unexpected revelation in Soon Ae’s death and the identity crisis between Bong Sun and Soon Ae. Although at first you take Soon Ae’s death for granted (since she started out as a ghost), the drama starts to allude that Soon Ae wasn’t kept on earth because of a virgin grudge but because there is a mystery to be solved regarding her murder. Little by little, clues and flashbacks are revealed that are not too obvious. I enjoy plot twists as much as the next person, and Oh My Ghost really had me gasping when I discovered the duplicitous nature of one of our characters. At the same time, Bong Sun finally becomes creepily aware of Soon Ae’s takeover of her body. 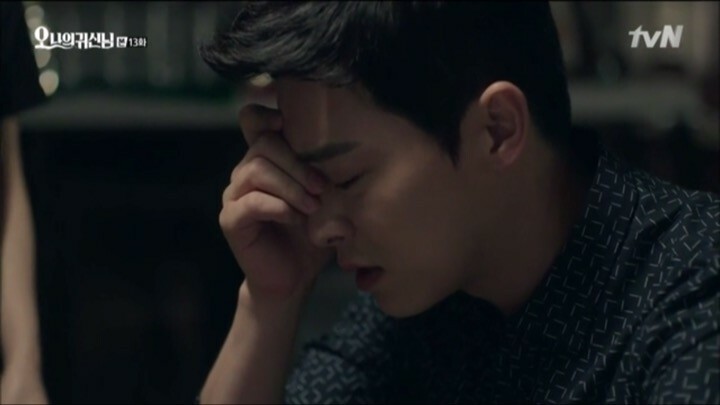 As Soon Ae continues to take Bong Sun’s body hostage against her will, she draws closer to Sun Woo, who subtly displays concern and interest towards Bong Sun. However, what intrigues me is that even when Bong Sun is not possessed, the chemistry between the leads is still there. The question we all have is: who does Sun Woo really like? Needless to say, there is never a dull moment. I am completely shipping the two main leads. Their chemistry is unstoppable! Oh My Ghost spends time to cultivate the character depth of the main leads during this section of the drama. Bong Sun and Soon Ae eventually befriend one another when they realize that their goals are similar. Soon Ae can help Bong Sun expand her long-term crush towards Sun Woo into a real relationship as long as Bong Sun lets Soon Ae use her body to fulfill her grudge. I would’ve preferred if the drama had developed their friendship more and included more scenes where both Bong Sun and Soon Ae are interacting, as opposed to having only one of the female characters active at a time. At this point, I am completely shipping the two main leads. The chemistry is unstoppable! I’ve never seen anyone smile the way Sun Woo does when he’s with Bong Sun — it’s just too honest and heartfelt. At first, I was really relieved when Soon Ae took over Bong Sun’s personality and gave her a backbone, but now she is becoming a little too aggressive for my taste. Instead, I want to see how Bong Sun does by herself, as she’s starting to build boldness and a voice of her own. A shift occurs when Soon Ae starts to develop real feelings for Sun Woo. She realizes that her affection for him may lead her to hurt Bong Sun, whom she is jealous of but also cares for. So Soon Ae immediately retreats and lets Bong Sun live her own life. There is a palpable change in Bong Sun’s confidence. I like how she is no longer the soft-spoken, clumsy kitchen assistant that she once was. I’ve surrendered to the fact that every Korean drama has to include a time when the two leads are apart for some reason, however silly or unnecessary. So I am okay that Bong Sun starts to doubt whether Sun Woo truly likes her or Soon Ae, even though this inevitably slows down the advancement of the plot. In fact, I find it extremely understandable that she needs some time away, since she can’t remember any of her interactions with Sun Woo. Bong Sun bravely announces to Sun Woo that she has been possessed by a ghost this entire time. I applaud that she’s making choices for herself and speaking up, which shows significant character growth since the beginning of the drama. Understandably, Sun Woo is extremely confused and incredulous. I feel like the span of time that he feels disillusioned by the whole ghostly possession is just the right amount. Sun Woo eventually decides, rationally or not, that he liked Bong Sun even before she was possessed. I love how Bong Sun’s Sunshine blog connects them throughout the drama (otherwise, I would not be convinced). Despite Bong Sun and Sun Woo being apart for most of these episodes, Oh My Ghost was not too monotonous because we see more of the backstory behind Soon Ae’s murderer. Although he is so disturbing (kudos to the actor), the drama sheds more light to why he is the way he is. I appreciate that the bad guy is multi-dimensional rather than just being pure evil. The last few episodes are dedicated to resolving Soon Ae’s murder. As she infiltrates the police, we inch closer and closer to connecting how her death and Sun Woo’s sister’s hit-and-run accident are related. During the investigation, Soon Ae also possesses other characters and it’s entertaining to see other actresses channel Soon Ae’s quirky personality. Oh My Ghost finishes on a heart-warming note as Soon Ae is finally able to say goodbye to her loved ones. I do wonder if there was a better way they could have resolved the killer’s storyline, which I felt was forced to end happily. Regardless, the cast is so strong that minor plot holes do not stifle the flow of the drama. Plus, a lovely cameo at the end just for laughs easily diverted my attention. Although Soon Ae is able to peacefully leave, it is clear that her spirit is now carried on in part by Bong Sun. It leaves a deep fulfillment to know that Bong Sun’s life has forever been changed for good because she knew Soon Ae, and vice versa. I’m sad to part with this diverse-themed, delightful drama, and I will really miss being part of the lively Sun Restaurant community.